There are many things at stake in this election. Women’s dignity and women’s right to control their bodies. Immigrant rights, voting rights of Black people and other people of color, racial justice in all its forms. Religious freedom. Disability rights and disability justice. The protection of the earth we walk on, the water we drink, the air we breathe. Tax fairness. International respect. Healthcare. The list of what is at risk with a Trump victory is endless. This post is about one tiny slice of those things. This post is about what is at stake in the space I have worked in for twenty years. About one of the core issues in my just-published book. This post is about what is at stake in the world of digital accessibility (abbreviated as a11y in social media). Digital accessibility is about making sure digital content is available and usable to everyone, including disabled people. Digital accessibility is about websites, mobile apps and other electronic content that people can use even if they can’t see a screen, hold a mouse, or hear a video. It is about the right to work, to vote, to financial privacy, to receive healthcare information, to benefit from government emergency information, and to participate in countless other activities and services that are now online. Twenty years of digital accessibility progress in the United States is on the line in next Tuesday’s presidential election. For many years I have written and spoken on the Digital Accessibility Legal Update. And people are interested. Over 1000 people registered for my recent update in the speaker series sponsored by captioning company 3Play Media. The digital update session at the CSUN and AccessU conferences are always packed. Just in the last two months I’ve done the update for the Accessibility Summit, the Inland Empire Disability Collaborative, the Inland Empire Health Plan, Accessibility Camp Bay Area, and the Alameda County Law Library MCLE series. People are interested because more and more private and public sector organizations are turning their attention to taking down barriers in the digital space. As I’ve spoken and written about advancements in digital accessibility for the past few months, I’ve felt momentum is finally building for accessible information and technology, issues my clients, co-counsel and I have worked on for two decades. I’ve been excited to report how the United States Department of Justice is an accessibility champion and how the Deaf community is fighting (and winning) for the right to captioned media. It’s been gratifying to share information about disabled students claiming their right to accessible course materials, supported by the federal Department of Education. And I’ve been proud to report on the organizations that continue to work collaboratively with the blind community, without lawsuits, in Structured Negotiation, the subject of my just-published book. All that is at stake in this election. Here’s what the Digital Accessibility Legal Update might well look like if Donald Trump wins the election. The US Department of Justice is charged with enforcing the Americans with Disabilities Act. In that role, the Department has consistently championed the rights of disabled people to access digital content. The Partnership on Employment and Accessible Technology recently compiled a list of 167 settlement agreements the Department negotiated to protect the rights of disabled people to access online services. A Trump Justice Department would not be a champion of anyone’s civil rights, including the civil rights of people with disabilities to participate in all society now makes available online. If people don’t vote for down ballot candidates who adhere to democratic principles, the very existence of the Americans with Disabilities Act might be at risk. The United States Department of Education has been another accessibility champion in the digital space. Earlier this year it announced accessibility settlements with eleven education institutions ranging from state agencies to local school boards. And this is just a fraction of what the Department has done (and is doing) to protect disabled students’ ability to get an education in the digital age. Donald Trump promises to cut the Department of Education “to shreds.” It is a safe bet that if there are any employees left they won’t be protecting the rights of disabled students. We all know that Donald Trump will wreck the Supreme Court for anyone who cares about civil rights and a host of other issues for generations to come. But the highest court is not the only part of the judicial system at stake in this election. Judges in the lower courts have advanced accessibility — advances at risk the first time someone goes to court before a Trump-appointed judge. A District Court Judge in Vermont issued an important ruling in the NFB v. Scribd case that recognized that blind people have the right to read on line. Read more about the Scribd case. The 2012 decision of a Massachusetts judge in the Netflix case was a crucial step forward in ensuring video captioning. And back in 2008 a California federal judge helped put web accessibility on the map with a pro-accessibility ruling in NFB v. Target. Many digital accessibility cases are in the legal pipeline — waiting for court rulings. Several pending cases involve the rights of blind people to access voting information and ballots online. Trump-appointed judges will not issue the next Scribd or Netflix rulings. They will issue different court orders that threaten the strong foundation for digital accessibility that has been built through litigated cases. Donald Trump’s position on the Affordable Care Act (ACA) is simple: “On day one of the Trump Administration, we will ask Congress to immediately deliver a full repeal of Obamacare.” Such action would be devastating to disabled people for many reasons. A little known part of the ACA is the right to accessible electronic health information. Section 1557 of the ACA prohibits discrimination in the delivery of health care. The regulations implementing that section, enacted by the Department of Health and Human Services just this summer, recognize that accessible digital content is a crucial component of avoiding discrimination. 45 CFR 92.204 requires all programs and activities under the ACA that are provided through digital channels to be accessible. Read more about the digital accessibility requirements of the ACA. The accessibility of health care information is fundamental to privacy and security. The Affordable Care Act regulations recognize that. Trump’s dismantling of the Act will dismantle those protections along with everything else. It is no secret that Donald Trump pledges to slash federal agency budgets, if not eliminate entire agencies and departments. Another federal agency supporting the rights of disabled people in the digital era is the Federal Communications Commission (FCC), the agency charged with implementing the 21st Century Communications and Video Accessibility Act (CVAA). Dedicated FCC staff have done important digital accessibility work during the current administration. Among other things, the FCC has advanced digital accessibility through regulations requiring access by disabled people to electronic messaging, web browsers, mobile phones laptops, television and online programming. Hearing aid compatibility, 911 access and real time text are other areas of FCC work under the CVAA and other laws. Will FCC staff be there in a post-Trump world to protect communications access in the digital world? They will not be. Structured Negotiation has been an effective strategy for achieving digital accessibility for twenty years. The websites and mobile applications of Major League Baseball, Bank of America, Anthem, Inc., Weight Watchers, the American Cancer Society and dozens of other organizations have been improved through the collaborative process. The nation’s pharmacies have begun to roll out talking prescription labels to ensure that blind people can take medication confidentially and confidently. All this without lawsuits being filed. Read a list of more than 50 settlements reached in the process. In my new book, I describe how Structured Negotiation builds relationships, avoids negative press releases, produces workable agreements, and protects civil rights. How it encourages corporate and government champions and gives disabled people a seat at the table. Read more about the book. But Structured Negotiation is not possible without legal claims. Legal claims that are at risk in this election. Without a legal claim, there can be no Structured Negotiation opening letter inviting organizations to participate in a collaborative process. There can be no alternative to discovery, no joint experts, no creative settlement agreements. Structured Negotiation is a strategy to protect and enforce claims. It is, as I’ve said so often, a tool in the lawyer and advocate’s tool box. No legal right to enforce, no Structured Negotiation. When I present the Digital Accessibility Legal Update to people outside the legal profession, I begin with a slide of a back pocket. In the pocket is a pencil, a tape measure and a scissors. I use the pocket to illustrate my belief that the law around digital accessibility belongs not just in a law book or a court house, but in everyone’s back pocket. Everyone needs to be able to explain that accessibility is a civil right. That accessibility is coding, policy, design, management processes, marketing, AND the right of disabled people to access content, services and information. Developers need the law in their back pocket to encourage team members. Designers rely on the legal tool to convince brand managers that online content needs to be accessible and beautiful. Champions throughout the organization need the law in their pocket to make sure accessibility efforts are adequately funded. The law is a driver in accessibility efforts in the United States. I have met accessibility champions in the legal departments of the biggest companies, and on the front lines of creative design. Each of those champions loses a vital tool for accessibility if Donald Trump wins the election. 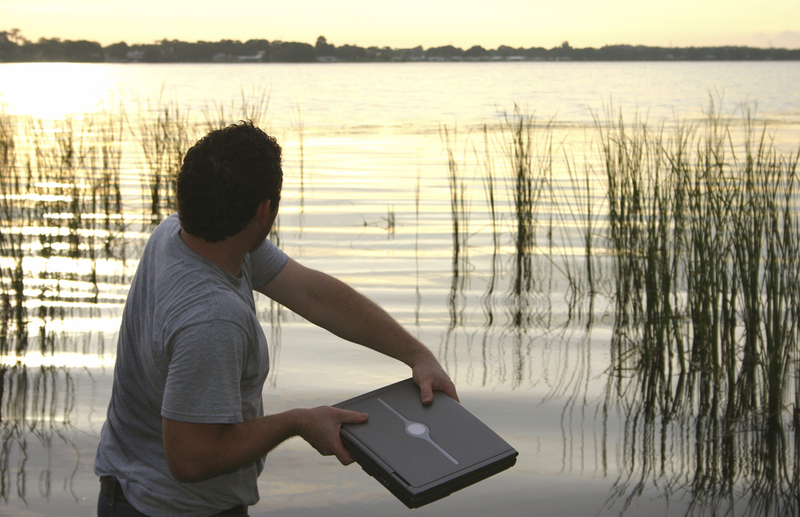 I illustrated this post with an image of a man about to toss his computer into a reed-studded lake at sunset. It symbolizes to me the risk of losing all the law has achieved to make the digital space available to everyone. But the man in the photo hasn’t thrown it yet. His arms are drawn back for the toss, but he hasn’t let go. There’s still time to preserve the hard fought gains in digital accessibility by doing all we can to make sure Donald Trump is not elected president of the United States. This a post about what would happen to digital access law in the United States if Donald Trump gets elected. Digital access means disabled people can use the web and mobile devices. Access laws and policies are at risk in the 2016 presidential election. Judges can set the clock backward. Federal agencies will stop fighting for the rights of disabled people. Previous Previous: Book Launch Celebration!